With that in mind, I decided to combine reading and writing with a bit of geography, with this super-fun “Oh, the Places I’LL Go!” craft. There are 4 graphic options of children reading a book. Students choose one, which becomes the “base” of their booklet. The cover of the hat, comes with & without the question words: Who? What? Why? When? Where & How? This flips up to reveal 3-pages of answers. Be sure and check the PREVIEW to see lots of samples. The craftivity provides an interesting way to practice & reinforce the “5 Ws + 1 H” question words in a fun way: “Where would you like to travel to?”, "When would you like to go? ", "Why do you want to go there? ", "Who do you want to go with? ", "What do you want to see?" and "How do you want to get there?" I’ve included a poster with the questions, which you can use to introduce your lesson. 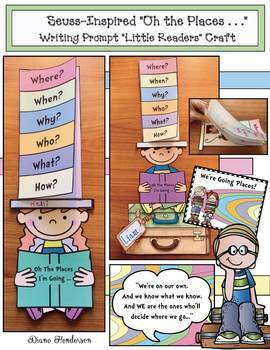 I’ve included a variety of posters as well as letters for the caption: “Oh, the Places We’ll Go!” to add extra pizzazz. I’m Diane from Teach With Me, wishing you an exciting journey.